The FAA has published its draft environmental assessment for issuing a launch license for SpaceX’s upcoming in-flight abort test for the Crew Dragon spacecraft. The following excerpts describe how Elon Musk’s space company will conduct the test next spring from NASA’s Kennedy Space Center’s Launch Complex 39A (LC-39A). Some long paragraphs have been divided into multiple ones to make the material easier to read. The abort test is currently scheduled for 2019. The abort test would involve observation, photography, and debris management associated with the breakup of the Falcon 9 first and second stages. The launch scenario where an abort is initiated during the ascent trajectory at the maximum dynamic pressure (known as max Q) is a design driver for the launch abort system. It dictates the highest thrust and minimum relative acceleration required between Falcon 9 and the aborting Dragon. As the in‐flight abort would occur during the first stage portion of the launch trajectory, the second stage of Falcon 9 would be simplified. The abort test would start with a nominal launch countdown and release at T-0. The Falcon 9 with the Dragon attached would follow a standard ISS trajectory with the exception of launch azimuth to approximately Mach 1. The Falcon 9 would be configured to shut down and terminate thrust, targeting the abort test shutdown condition (simulating a loss of thrust scenario). Dragon would then autonomously detect and issue an abort command, which would initiate the nominal startup sequence of Dragon’s SuperDraco engine system. Concurrently, Falcon 9 would receive a command from Dragon to terminate thrust on the nine first stage Merlin 1D (M1D) engines. Dragon would then separate from Falcon 9 at the interface between the trunk and the second stage, with a frangible nut system. Under these conditions, the Falcon 9 vehicle would become uncontrollable and would break apart. SpaceX would not attempt first stage booster flyback to KSC, CCAFS, or a droneship, nor would they attempt to fly the booster to orbit. Dragon would fly until SuperDraco burnout and then coast until reaching apogee, at which point the trunk would be jettisoned. 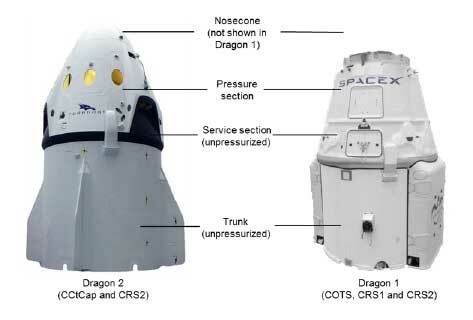 Draco thrusters would be used to reorient Dragon to entry attitude. Dragon would descend back toward Earth and initiate the drogue parachute deployment sequence at approximately 6 miles altitude and main parachute deployment at approximately 1 mile altitude. 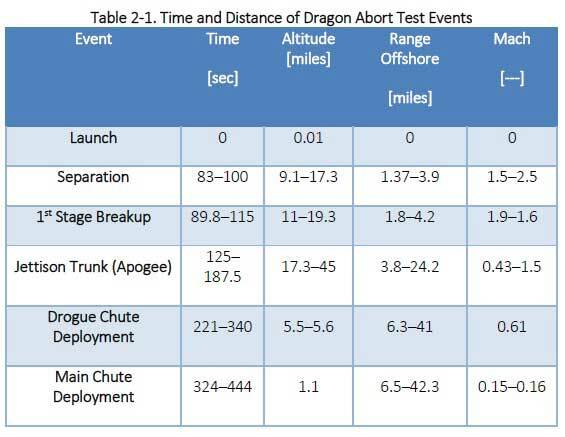 Dragon recovery operations would be very similar to actions for normal Dragon reentry and recovery, although Dragon recovery during the abort test would occur approximately 9–42 miles from shore, and normal Dragon recovery is approximately 200 miles offshore. The recovery vessel would recover all parachutes deployed by Dragon, as possible, including the two drogue and four main parachutes. Recovery of the drogue parachute assembly would be attempted if the recovery team can get a visual fix on the splashdown location. However, because the drogue parachute assembly is deployed at a high altitude, it is difficult to locate. In addition, because of the size of the assembly and the density of the material, the drogue parachute assembly becomes saturated within approximately one minute of splashing down and begins to sink. This makes recovering the drogue parachute assembly difficult and unlikely. The Dragon test vehicle is intended to represent the final flight configuration of Dragon-2. Systems, subsystems, and components critical to the success of in-flight abort would be in the final configuration. Non-critical systems would either be eliminated or simplified to reduce the complexity of the ground refurbishment process to conduct the abort test. Dragon would contain approximately 5,650 pounds of hypergolic propellant, including approximately 3,500 pounds of dinitrogen tetroxide (NTO) and 2,150 pounds of monomethylhydrazine (MMH). Dragon would contain approximately 2,400 pounds of residual propellant after the abort test. A Falcon 9 (Block 5) first stage booster would be used for the abort test. The booster would be a standard Falcon 9 first stage and configured in an expendable configuration for the abort test. Landing legs and grid fins would be removed. No booster recovery burns would be attempted. As such, a full triethylaluminum-triethylborane (TEA-TEB) mixture used as a first and second stage ignitor would not be used. The booster would be capable of flying a mission profile that allows for the target abort velocity to be achieved. The booster would include nine M1D engines and be configured to perform an ascent abort shutdown. Each engine is propelled by liquid oxygen (LOX) and rocket fuel (RP-1; highly refined form of kerosene) and produces 190,000 pounds of thrust at sea level (for a total of 1.71 million pounds of thrust from all nine engines). The booster would carry the standard set of flight instrumentation. The second stage would be a standard Falcon 9 second stage, with the exception of the M1D vacuum engine. The components essential to propellant loading operations would be carried, but the thrust chamber, turbopump, thrust vector control actuators, and other components required for performing second stage burns, would be omitted, as the mission concludes part-way through the first stage ascent burn. Propellant loading would follow standard loading operations for the second stage. During the initial flight of the Falcon 9 with the Dragon attached, the flight track would be normal. The separation of Dragon from Falcon 9 would occur approximately between 83 and 100 seconds after launch. Dragon and the trunk would separate from the second stage and continue to coast to its apogee, eventually dropping the trunk and deploying the drogue parachutes. At the point where Dragon and the trunk separate, the first and second stage would become unstable and break up approximately 2–4 miles down range from the shore. 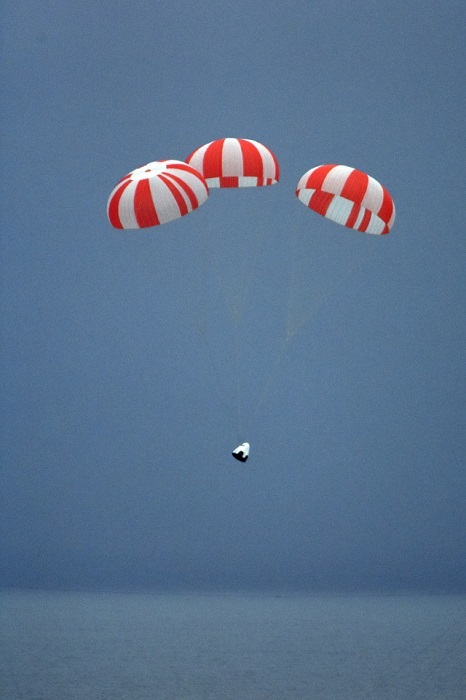 After the main chutes deploy, Dragon would drift approximately 3 miles and land approximately 9–42 miles from shore. Table 2-1 presents time and distance for each of the abort test events. Thanks. I guess they will wait until the wind is offshore. I think the old Dragon looks better myself. Because it would be a waste of money. Everything that needs to be the same, in order to gather the required data, is the same. No one has ever required a full up in flight abort test. When NASA was developing the Mercury capsule, they didn’t do the abort tests using Redstone or Atlas missiles. Instead, they used the Little Joe. Likewise, when testing Apollo, they didn’ use Saturn IB or Saturn Vs, they used a bigger version of the Little Joe. 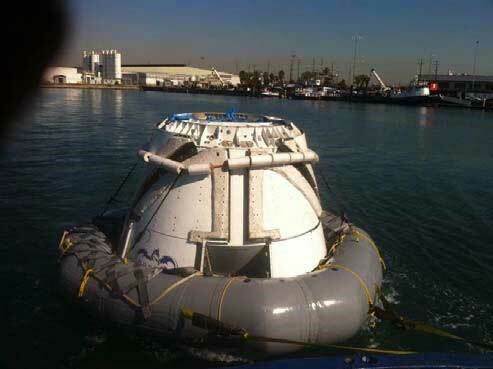 Whats more, neither program used fully flight qualified capsules. Instead, they used engineering test capsules. 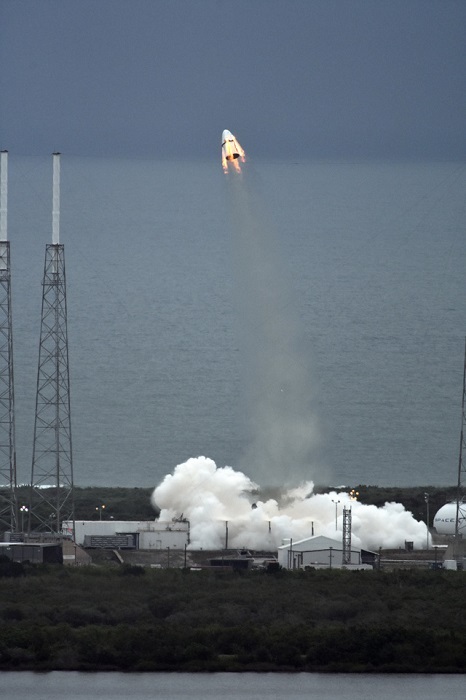 SpaceX’s abort test will be the most faithful one ever attempted. It will be the most faithful flight abort test so far. It’s interesting and important to note that this test is way, way closer to an actual flight booster than any other abort test. Can you imagine a real set of SRBs and a core SLS stage used in an abort test! That would be very cool, and very, very expensive. SpaceX can afford to take it’s oldest booster and sacrifice it to the ASAP abort gods. That being said, it would be nice to have a 100% real rocket sacrificed in an abort test. A bit of a waste of money, but still cheaper than SLS.